Dubai: It’s time to unplug if you want to enjoy your next music concert, say audiologists and doctors. Listening to high decibel music for more than six hours a day, through personal devices that are plugged into the ear, has resulted in moderate to severe hearing loss among the younger generation in the UAE. More than 25 per of the youth are suffering from sudden hearing loss due to exposure to loud music. Mohammad Ayas, senior audiologist at the new audiology clinic that opened at the University Hospital of Sharjah said that because the clinic was attached to a university, they received many patients who were students. He reported a steady traffic of 25 to 30 teenagers reporting at the clinic complaining of pain and a tingling sensation in their ears. Dr Murtaza Najmi, ENT specialist at the iCare Clinics validated this finding. “People who are constantly exposed to high frequency noise suffer from loss of hearing. We usually have young patients coming in a day after attending a heavy metal concert, complaining of ringing noise in their ears. People think that such hearing loss is sudden. However, this kind of hearing loss happens as a result of a prolonged exposure to high frequency sounds and is progressive, never sudden. In today’s world, where we are enveloped by an environment acclimatised to loud music, explosions, movies with loud sounds, construction and traffic. It is common to find people complaining of hearing problems. It is important to educate the community and raise awareness about this to avoid such exposure and conserve one’s hearing,” he said. Hearing loss occurs usually in the geriatric population as they experience age-related deterioration that is sometimes brought about as a side-effect of a long history of lifestyle diseases like diabetes. But the recent trend shows that it is now becoming common in the younger population. Today, at least 25 per cent of the youth is susceptible to hearing loss, owing to their listening habits and there was very little awareness about it, according to Ayas. He explains that sustained exposure to loud sounds causes physiological damage to the auditory canal and inner ear. “The hair cells within the auditory canal get damaged due to prolonged exposure to loud noise, between 90-120 decibels a day. 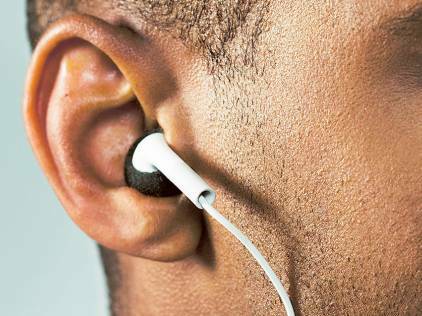 The hair cells either die off or are damaged, resulting in moderate to profound hearing loss. The damage can be assessed through simple auditory evaluation,” he said. Based on the examination, a patient can be diagnosed as having mild, moderate or severe hearing loss. Why does it occur in the younger generation? The conventional level of sound that the normal ear can tolerate on a daily basis is between 20-25 decibels. But the trend these days is for young people to constantly have hearing devices plugged into their ears. They walk around with it, do their homework with the devices plugged in and work out in a similar fashion. “If you are constantly exposed to a sound level between 60-80 decibels on a daily basis for six to eight hours, many auditory changes take place in the inner ear. We diagnose it as Noise Induced Hearing Loss (NIHL), which can either be short-term or long-term,” said Ayas. Symptoms can range from mild ear pain to tingling, to loud and constant ringing in the ears (tinnitus) and eventually, a time comes when the individual is unable to hear normal conversation. “The good news is that early intervention can, in many cases, help mitigate the damage. “If the NIHL is short term or sudden, then there is no need for medical intervention. The patient needs to stop hearing loud music and slowly his sense of hearing gets restored. If the hearing damage is long-term, then we assess whether it ranges from mild to moderate or severe to profound. Then we design a hearing aid tailored to the needs of the patient and he is advised on its proper usage and given basic training. If a patient does not respond to hearing aids, he is advised to go in for a cochlear implant,” said Ayas. Hearing aids are not usually covered by insurance. The new-age hearing aids are not visible to others and can be placed within the auditory canal. They are usually waterproof and require low maintenance that includes a change of case and a change of batteries periodically. Patients who have hearing loss are advised to get the aids as they not only help in assisting the individual in clear hearing but also act as protective devices for the ear.